This example shows how to build an exponential degradation model to predict the Remaining Useful Life (RUL) of a wind turbine bearing in real time. 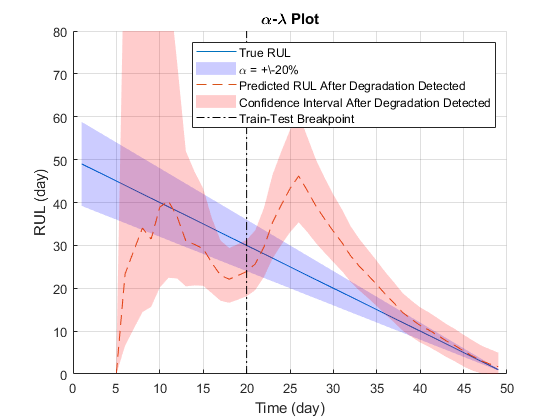 The exponential degradation model predicts the RUL based on its parameter priors and the latest measurements (historical run-to-failure data can help estimate the model parameters priors, but they are not required). 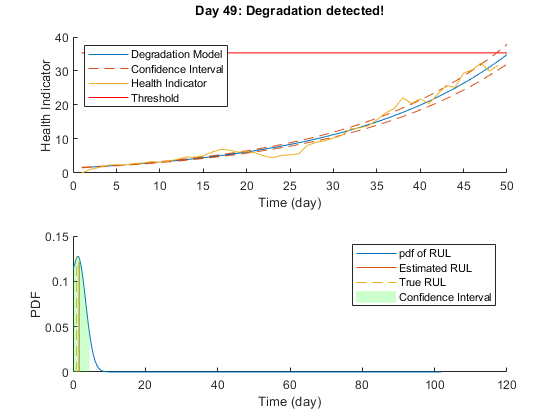 The model is able to detect the significant degradation trend in real time and updates its parameter priors when a new observation becomes available. The example follows a typical prognosis workflow: data import and exploration, feature extraction and postprocessing, feature importance ranking and fusion, model fitting and prediction, and performance analysis. The dataset is collected from a 2MW wind turbine high-speed shaft driven by a 20-tooth pinion gear . 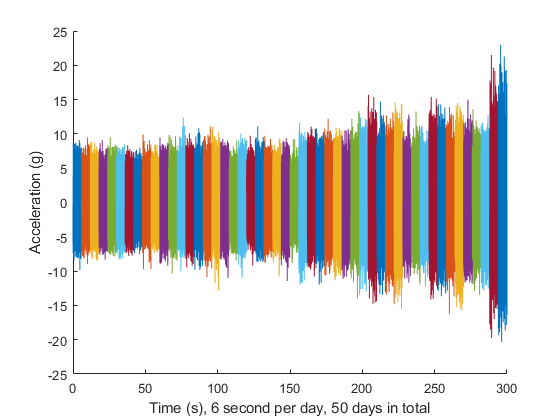 A vibration signal of 6 seconds was acquired each day for 50 consecutive days (there are 2 measurements on March 17, which are treated as two days in this example). An inner race fault developed and caused the failure of the bearing across the 50-day period. A compact version of the dataset is available in the toolbox. To use the compact dataset, copy the dataset to the current folder and enable its write permission. The measurement time step for the compact dataset is 5 days. For the full dataset, go to this link https://github.com/mathworks/WindTurbineHighSpeedBearingPrognosis-Data, download the entire repository as a zip file and save it in the same directory as this live script. Unzip the file using this command. The measurement time step for the full dataset is 1 day. The results in this example are generated from the full dataset. It is highly recommended to download the full dataset to run this example. Results generated from the compact dataset might not be meaningful. 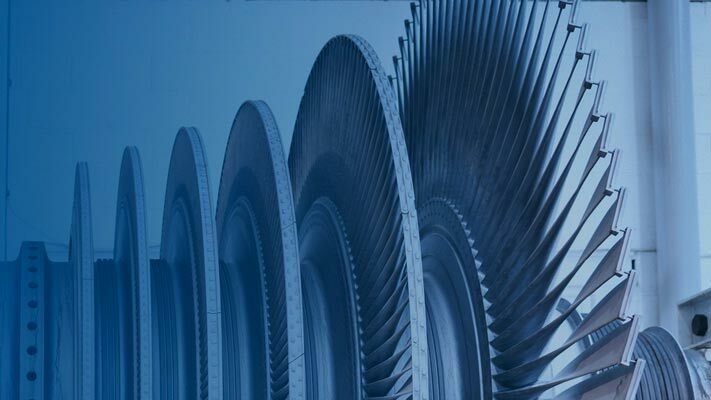 Create a fileEnsembleDatastore of the wind turbine data. The data contains a vibration signal and a tachometer signal. The fileEnsembleDatastore will parse the file name and extract the date information as IndependentVariables. See the helper functions in the supporting files associated with this example for more details. Sample rate of vibration signal is 97656 Hz. This section explores the data in both time domain and frequency domain and seeks inspiration of what features to extract for prognosis purposes. First visualize the vibration signals in the time domain. 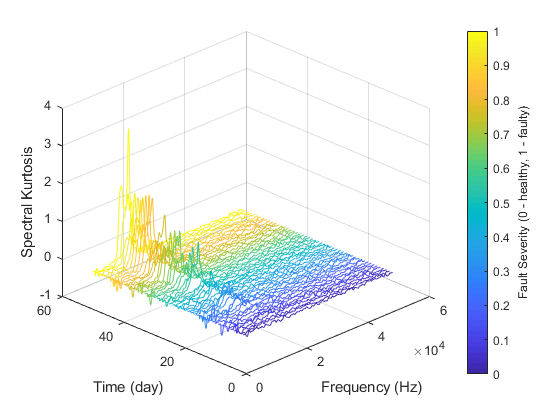 In this dataset, there are 50 vibration signals of 6 seconds measured in 50 consecutive days. Now plot the 50 vibration signals one after each other. The vibration signals in time domain reveals an increasing trend of the signal impulsiveness. Indicators quantifying the impulsiveness of the signal, such as kurtosis, peak-to-peak value, crest factors etc., are potential prognostic features for this wind turbine bearing dataset . 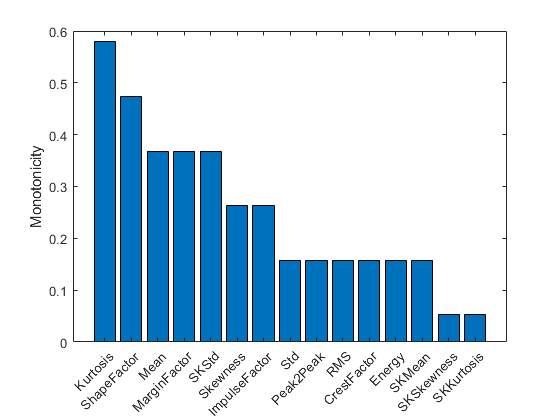 On the other hand, spectral kurtosis is considered powerful tool for wind turbine prognosis in frequency domain . To visualize the spectral kurtosis changes along time, plot the spectral kurtosis values as a function of frequency and the measurement day. Fault Severity indicated in colorbar is the measurement date normalized into 0 to 1 scale. It is observed that the spectral kurtosis value around 10 kHz gradually increases as the machine condition degrades. Statistical features of the spectral kurtosis, such as mean, standard deviation etc., will be potential indicators of the bearing degradation . Based on the analysis in the previous section, a collection of statistical features derived from time-domain signal and spectral kurtosis are going to be extracted. More mathematical details about the features are provided in [2-3]. First, pre-assign the feature names in DataVariables before writing them into the fileEnsembleDatastore. Compute feature values for each ensemble member. Select the independent variable Date and all the extracted features to construct the feature table. Since the feature table is small enough to fit in memory (50 by 15), gather the table before processing. For big data, it is recommended to perform operations in tall format until you are confident that the output is small enough to fit in memory. Convert the table to timetable so that the time information is always associated with the feature values. Extracted features are usually associated with noise. The noise with opposite trend can sometimes be harmful to the RUL prediction. In addition, one of the feature performance metrics, monotonicity, to be introduced next is not robust to noise. Therefore, a causal moving mean filter with a lag window of 5 steps is applied to the extracted features, where "causal" means no future value is used in the moving mean filtering. Here is an example showing the feature before and after smoothing. Moving mean smoothing introduces a time delay of the signal, but the delay effect can be mitigated by selecting proper threshold in the RUL prediction. In practice, the data of the whole life cycle is not available when developing the prognostic algorithm, but it is reasonable to assume that some data in the early stage of the life cycle has been collected. Hence data collected in the first 20 days (40% of the life cycle) is treated as training data. The following feature importance ranking and fusion is only based on the training data. In this example, monotonicity proposed by  is used to quantify the merit of the features for prognosis purpose. where n is the number of measurement points, in this case n=50. m is the number of machines monitored, in this case m=1. xij is the ith feature measured on jth machine. diff(xij)=xij(t)-xij(t-1), i.e. the difference of the signal xij. Kurtosis of the signal is the top feature based on the monotonicity. Features with feature importance score larger than 0.3 are selected for feature fusion in the next section. Principal Component Analysis (PCA) is used for dimension reduction and feature fusion in this example. 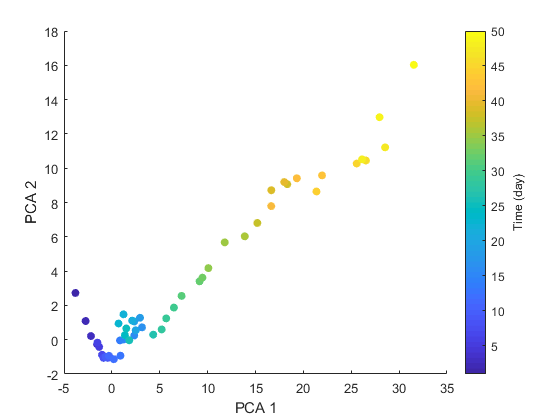 Before performing PCA, it is a good practice to normalize the features into the same scale. Note that PCA coefficients and the mean and standard deviation used in normalization are obtained from training data, and applied to the entire dataset. The mean, standard deviation and PCA coefficients are used to process the entire data set. Visualize the data in the space of the first two principal components. The plot indicates that the first principal component is increasing as the machine approaches to failure. Therefore, the first principal component is a promising fused health indicator. E[h(t)|θ ,β ] = ϕ+θ exp(β t). Here an Exponential Degradation Model is fit to the health indicator extracted in the last section, and the performances is evaluated in the next section. First shift the health indicator so that it starts from 0. The selection of threshold is usually based on the historical records of the machine or some domain-specific knowledge. 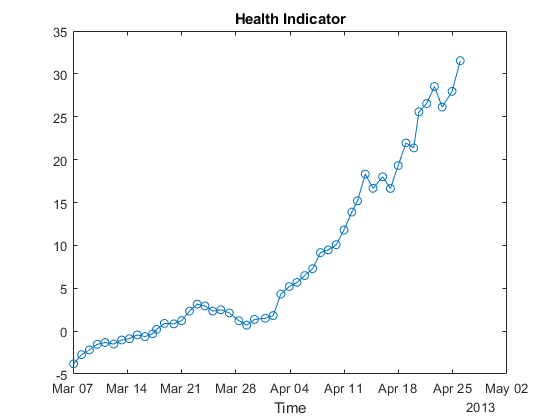 Since no historical data is available in this dataset, the last value of the health indicator is chosen as the threshold. 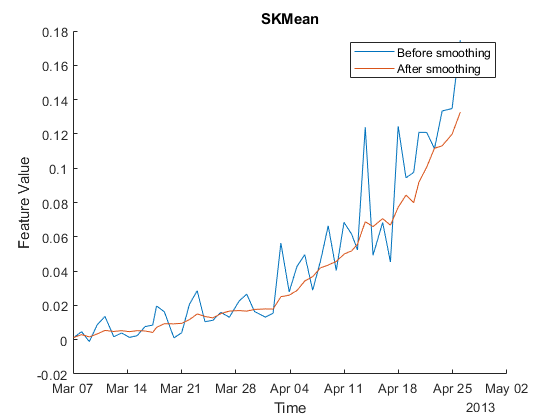 It is recommended to choose the threshold based on the smoothed (historical) data so that the delay effect of smoothing will be partially mitigated. If historical data is available, use fit method provided by exponentialDegradationModel to estimate the priors and intercept. However, historical data is not available for this wind turbine bearing dataset. The prior of the slope parameters are chosen arbitrarily with large variances (E(θ)=1, Var(θ) =106,E(β)=1,Var(β)=106) so that the model is mostly relying on the observed data. Based on E[h(0)]=ϕ+E(θ), intercept ϕ is set to -1 so that the model will start from 0 as well. Here the standard deviation of the noise is assumed to cause 10% of variation of the health indicator when it is near the threshold. Therefore, the standard deviation of the noise can be represented as 10%⋅thresholdthreshold-ϕ . The exponential degradation model also provides a functionality to evaluate the significance of the slope. Once a significant slope of the health indicator is detected, the model will forget the previous observations and restart the estimation based on the original priors. The sensitivity of the detection algorithm can be tuned by specifying SlopeDetectionLevel. If p value is less than SlopeDetectionLevel, the slope is declared to be detected. Here SlopeDetectionLevel is set to 0.05. Now create an exponential degradation model with the parameters discussed above. Use predictRUL and update methods to predict the RUL and update the parameter distribution in real time. Here is the animation of the real-time RUL estimation. where r(t) is the estimated RUL at time t, r*(t) is the true RUL at time t, Θ(t) is the estimated model parameters at time t.
Since the preset prior does not reflect the true prior, the model usually need a few time steps to adjust to a proper parameter distribution. The prediction becomes more accurate as more data points are available. 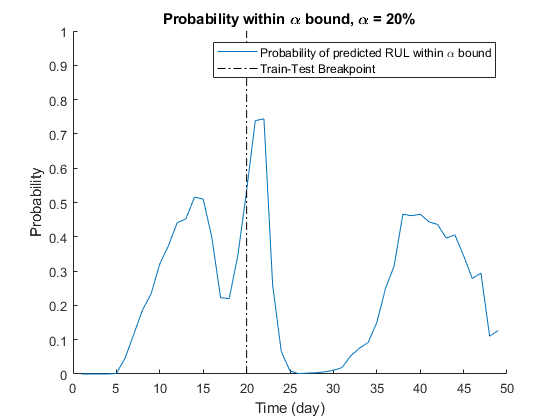 Visualize the probability of the predicted RUL within the α bound. <http://data-acoustics.com/measurements/bearing-faults/bearing-3/> Bechhoefer, Eric, Brandon Van Hecke, and David He. "Processing for improved spectral analysis." Annual Conference of the Prognostics and Health Management Society, New Orleans, LA, Oct. 2013. Ali, Jaouher Ben, et al. "Online automatic diagnosis of wind turbine bearings progressive degradations under real experimental conditions based on unsupervised machine learning." Applied Acoustics 132 (2018): 167-181. Saidi, Lotfi, et al. "Wind turbine high-speed shaft bearings health prognosis through a spectral Kurtosis-derived indices and SVR." Applied Acoustics 120 (2017): 1-8. Coble, Jamie Baalis. "Merging data sources to predict remaining useful life–an automated method to identify prognostic parameters." (2010). Saxena, Abhinav, et al. "Metrics for offline evaluation of prognostic performance." International Journal of Prognostics and Health Management 1.1 (2010): 4-23.